In this 21st century, it is common knowledge that breast cancer treatment has made great strides. A diagnosis of breast cancer today is no longer a death sentence, and the treatment is no longer more painful than the disease. Today, women with breast cancer live longer and better than ever before. Many are completely cured. And the future looks even brighter, with individualised, cutting-edge therapies being tested and developed right now. It is with this advancement that we are optimistic future breast cancer treatments will be a lot smarter about the cells they target. The older and more traditional approaches that we are familiar with such as the standard chemotherapy and radiation tend to attack all rapidly dividing cells throughout the body. That includes healthy cells lining the hair follicles and the intestines, as well as the intended cancer cells. Yes, the approach can work, but it also causes many of traditional chemotherapy’s infamous side effects. But over the years medical researchers have learned that breast cancers, like people, are not identical. And they have been using this knowledge to develop more effective, less toxic drugs. By discovering precisely how tumours differ from person to person, they have begun creating treatments that seek out and destroy specific types of cancer cells, and only those cancer cells — leaving healthy cells alone. Breast cancer is the most common cancer in most part of the world and it is the number one leading cause of cancer deaths. In Malaysia, breast cancer is the most common cancer in women in all major races with overall age-standardised incidence rate of 28.2 per 100,000 population (NCR Report 2008). The risk is about 1 in 20 women, which is half of that seen in western countries with the peak age specific incidence rate in the 55 to 59 age group. The majority of patients present at Stage II & III; with both stages comprising more than 60% of all breast cancer patients. In addition, majority of the stage II presenting patients come from urban areas. However, these late presentations are still widely seen amongst those residing in the rural areas as well as the East Coast of Malaysia. A complex interplay of health system and patient factors are believed to have contributed to such a picture. The lack of a nationwide population-based mammogram screening programme is identified to be a significant factor. Currently, screening is being offered at low cost and in some instances for free. However the uptake is for selected groups of patients only. That is, those in the high risk group and those patients presenting themselves to public health facilities seeking treatment for some medically related complaints and at the same time fit the set criteria for mammogram screening (opportunistic screening). A study in a local university hospital published in 2014 showed a pick-up rate of 5 per 1000 women screened and 125 per 1000 for targeted high-risk groups, comparable to screening programmes offered by countries with higher breast cancer incidence rates. Other factors contributing to this scenario of late presentation and detection are those related to cultural and psychosocial. As in many other countries, Malaysians (especially amongst the Malays) have strong preponderance and beliefs towards alternative (traditional) treatments. In many instances, these patients sought traditional including faith healers as their first choice of treatment option upon diagnosis by doctors. Only when such modalities fail, do they seek medical attention. It is still an ongoing battle to inform and educate such groups of patients although there seems to be a decreasing number of such patients over the years. Strategies to overcome this include persistent continuous health education programmes done in a concerted and coordinated effort between the Health Ministry and other related governmental and non-governmental agencies. I also believe that with good and more coordinated working collaborative relationship amongst primary care doctors, NGOs and other government agencies such as the LPPKN, the uptake of the mammogram screening programme can be better than what is achieved now. 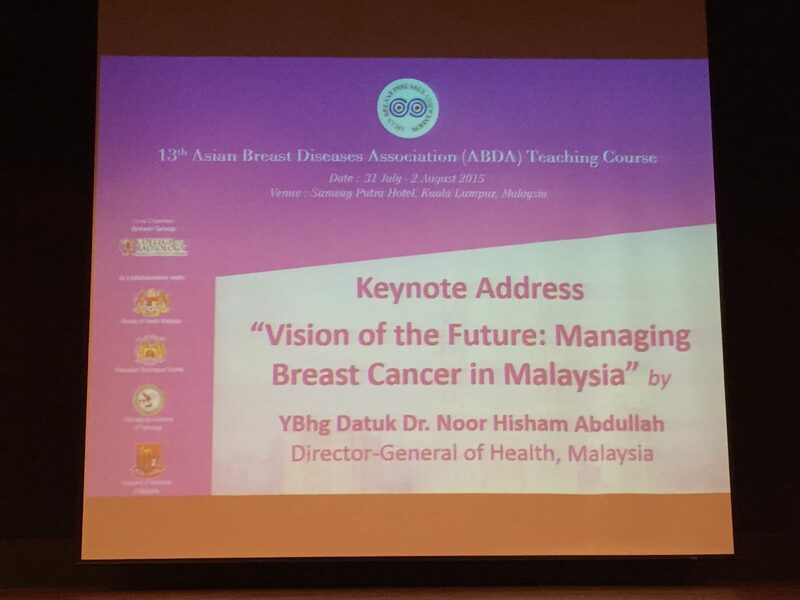 Malaysia in the future will see a rising and worrying trend of breast cancer incidence as already seen in Singapore, Japan and Korea. This increasing incidence will provide additional challenges for us as Malaysia is still undergoing the process of strengthening its services, as well as ensuring better accessibility. Currently, we are observing a worrying proportion (of approximately 30%) of women defaulting chemotherapy with about 36% Tamoxifen defaulters in the first year of use itself. The key word to cancer control in general is working together by harnessing each other’s strength and resources especially in the areas of training and screening service provision. Ensuring timeliness of diagnosis and better accessibility are areas of priority. Due to the low incidence rate in the population, a targeted screening programme by identifying high-risk individuals is still the preferred strategy. Facilities to diagnose and treat breast cancer patients are mainly available in all major public hospitals offering cancer treatment services. It is very much in the realm of general surgeons. However we now have increasing number of surgeons trained under Breast & Endocrine Surgery Subspecialty to undertake breast cancer management. Presently we have dedicated Breast Surgeons in 8 major government hospitals (HKL; HPJ; HSIJB; HRPZIIKB; HSNZKT; HRPBI; HPP; HQEKK). Additionally two academic medical centres namely the UMMC and UKMMC also provide dedicated breast cancer care services and help in relieving some burden in services in Klang Valley areas. All the above said hospitals provide ‘ One-Stop Centres’ where patients with suspicious breast lesions will be seen at Breast Clinic, with subsequent imaging and biopsy of the lesions can be done in one day. These centres also will usually have access to Oncology Service for patients’ adjuvant treatment. All these specialised centres also function as tertiary referral centres for other parts of the country. Despite such progress in facility development, accessibility to such services is still a major issue especially to those living in rural areas. These patients when diagnosed by medical officers or by primary care physicians at health clinics then need to be referred to the nearest hospital, which is probably a district hospital without specialists. Thus, the problems do not end there. Since such hospitals do not have either general surgeons or full cancer care facilities, more often than not these patients will need to be referred to other hospitals for Oncology treatment thus causing further treatment delays. It is thus the objective of the Health Ministry to develop more treatment centres in its effort to make the service more accessible to different groups and levels of the population. To ensure the quality of services are maintained and at par with international overseas standards, measurement systems are being planned to be introduced. 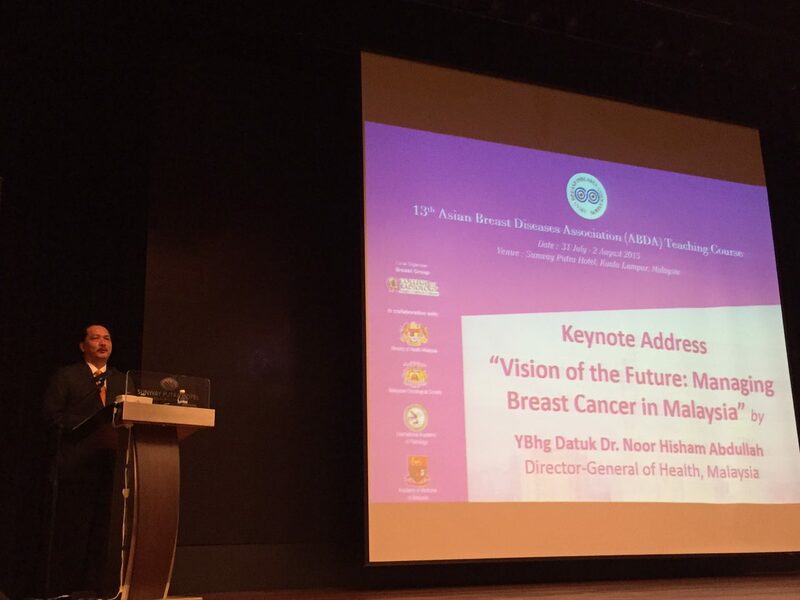 Towards this, the Malaysian Oncology Society has initiated a health performance measurement and reporting system involving breast surgeons around the country to assist in auditing service performance. This is a positive step in the right direction if Malaysia is to compete with other reputable international centres. Breast cancer is a very heterogenous tumour. It is with this breakthrough of its nature that more emphasis is being made on molecular pathology. The mainstay of diagnosis of breast cancer is tissue diagnosis. Most major hospitals in the country have Pathology Services that provide standard reporting which include ER/PR receptors IHC staining for HER2 receptor. However, the HER2 confirmatory D-DISH test is only available currently at regional centres covering Central, Northern & East Malaysia. It is also available in UMMC & UKMMC. There are also other molecular biomarkers such as Ki67, Basal types etc for determining the molecular subtype of breast cancer. From this information, the nature and aggressiveness of the tumour behaviour can be determined which will help clinicians to decide the type of treatment that need to be given. Unfortunately these tests are expensive and have not yet been made available for use in public setting. As there is now overwhelming evidence of the efficacy and benefits of these new specialised tests, the immediate future is to have more access to the molecular special tests, as this will bring the management of breast cancer to “personalised management” tailor-made to specific individual needs. There is a need to enhance the laboratory services and making these sophisticated tests widely available to other centres throughout the whole country. Nevertheless it must be cautioned that stringent quality control is required in setting up laboratory for HER2 testing to ensure accuracy and reliability of results. This also includes handling of biopsy tissue or specimen in theatre and the processing of the specimen. Towards this, a collaborative effort is already in progress among the pathologists and breast surgeons both from MOH and University under their respective Colleges to produce a guideline “Best Practice Guidelines For Quality Human Epidermal Growth Factor Receptor 2 (HER-2) Testing in Breast Cancer for HER-2 Targeted Therapy in Malaysia” which will be launched shortly. The use of the Mammogram is still the gold standard tool in diagnosing and screening of breast cancer. Currently digital mammogram is available in most major hospitals. Nonetheless more and more centres are using Ultrasound examination as complementary to Mammogram especially by Breast Surgeons as part of the bedside examinations. The use of ultrasounds helps in making fast diagnosis especially for benign conditions such as breast cysts as well as any suspicious lesions. It is for such reasons that training in Breast ultrasound will be added as part of the training curriculum for future breast surgeons. The use of Tomosynthesis 3-D Mammogram with its better resolutions and therefore more accurate description of lesions will also be enhanced in many of the treatment facilities. Currently, because of its high cost, 3D Mammogram is only available in private medical facilities and University hospitals. It is highly likely that selected Ministry of Health facilities will be placed with such equipment when financial resources permit. Surgical treatment for breast cancer has long undergone transformation- from Radical Mastectomy by Halsted in the late 19th century to breast conserving surgery (BCS) for small tumours in the 21st century. This is especially so with the advent of mammogram screening. With the introduction of Sentinel Lymph Node Biopsy (SLNB) from late 90’s it is now considered as a standard procedure although there is still variant in practices in different centres. However despite these evolutions, in countries where the main tumour burden is still at intermediate and advanced stage, treatment is still the standard mastectomy & axillary clearance. For us in Malaysia, SLNB is not widely practiced due to patients mostly having large size tumors and presentation in advanced stages. Currently, SLNB is available in some MOH Hospitals i.e HPJ; HSIJB; HPP; (HRPBIpoh, HQE & HKL are starting this year); UMMC; UKMMC and a few private hospitals. Worldwide, the current trend is incorporating the component of plastic surgery in breast surgery as a means of limiting the consequences of disfigurement. Usually whenever cosmetics becomes a major concern for patients, reconstructive surgery is being offered and performed by Plastic Surgeon either as combined surgery or performed at a later stage depending on the suitability of cases. However due to logistic reasons and limited supply of plastic surgical services, more and more breast surgeons perform “Oncoplastic Surgical Procedures” ranging from simple implants, to tissue flap. Some of these procedures may be performed as a combination e.g. Implant with LD Flap reconstruction. The great advantage in having this set of expertise will be the provision of higher level of satisfaction among patients. The latter will have the breast cosmesis part taken care of without compromising the safety and at the same time they receive assurances that proper oncological clearance is achieved. 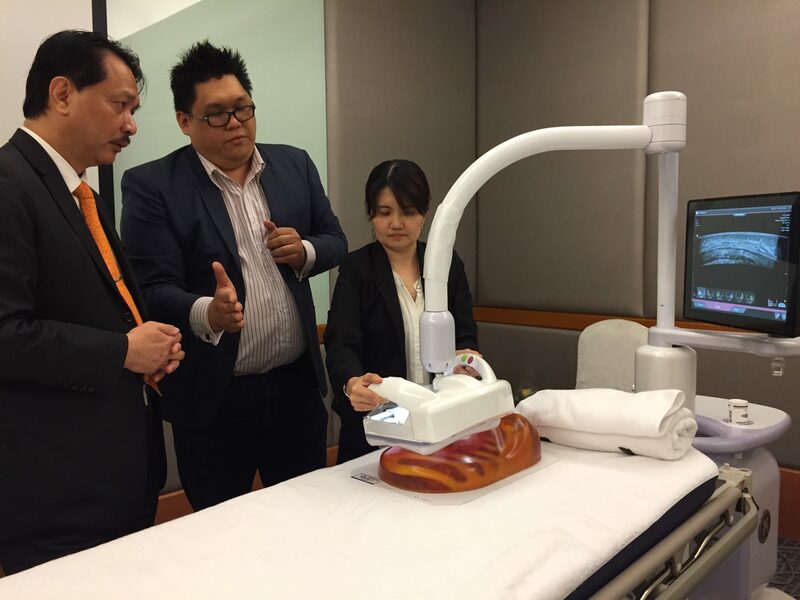 Such cutting edge advances in surgical procedures without compromising patient safety is a standard that our Malaysian surgical fraternity must strive for. For this, there must be planning for further sub-speciality training and exposure of breast surgeons to oncoplastic works. This can be achieved by incorporating them as part of fellowship training to recognised international centres. The provision of Oncology services is the other essential component in managing breast cancers. Given the nature of most of patients presenting at Stage 2 and above, a large proportion of patients will require adjuvant chemotherapy and radiotherapy. This part of the management is among the most critical. To date, the development of oncological drugs in breast cancer treatment has been tremendous with introduction of newer agents including the targeted therapies. However as a result of their high costs for procurement, most oncological drugs used are still the traditional regime that has been used past 5-10 years. In addition, there is a dearth in the availability of oncologists. This is not helped by the fact that those trained by the Ministry have resigned to work in the private sector. Towards this, the Health Ministry will continue to expand its training programme to produce more oncologists. For this, the Health Ministry is aggressively scouting for internationally recognised centres to assist in the training of its doctors interested to pursue oncology specialisation. In addition, the Ministry will also pursue for greater budget drug allocation to at least ensure that the referral centres will have oncology drugs made available. In general, genetically linked breast cancers only make up about 5% of all breast cancers. However the risk of an individual with such a family history is known to be higher. In Malaysia, we do have about 140 families that have been tested and identified to be in such a group. BRCA 1 & 2 genetic testing is currently available in HKL, UMMC, UKMMC and some private centres. Availability of the tests alone is not sufficient to run an effective Breast Cancer Genetic Service. It also requires the service of Clinical Geneticists, which currently are of very limited numbers. Their roles in giving proper information, education and counselling to patients and family members are very significant as they assist in avoiding confusion amongst patients and their carers, and also help allay unnecessary anxieties and fear. In this aspect, our country needs to embark on setting up more genetics services to provide protection for patients and their families faced with such disposition. Although women with such genetic disorders remain a small proportion of breast cancer patients, ethically it is still the responsibility of the Ministry to assist by identifying their unaffected relatives as a means of providing a more effective cancer strategy. As a start, there is a need to formulate a legal framework for genetic testing and genetic information discrimination. MULTIDISCIPLINARY TEAM APPROACH IN BREAST CANCER MANAGEMENT: THE FINAL LINK? An essential key success factor in managing breast cancer patients is to have a dedicated Multidisciplinary Team (MDT) comprising the surgeon, radiologist, pathologist and oncologist. Additional team members usually include the Breast Care Nurse, and any other related specialty when the needs arise e.g. Obstetrician & Neonatologist if involving pregnant patients with breast cancers. A regular MDT meeting should be part of the main activities in a specialised Breast Cancer Care Centre apart from Breast Clinics and dedicated operation theatres. Unfortunately due to the shortage of manpower and service availability, not all our centres have this capacity. However every effort will be made to set up a proper MDT. In the transition period where certain services are not yet available e.g. Oncology service, the use of modern information technology such as tele-conferencing can be made available. Training and retaining of manpower – the biggest asset. Need to increase numbers of breast surgeon, radiologist and pathologist and especially Oncologists to fill up the gaps and needs in future. Additional expertise such as Clinical Geneticists; Genetic counselor; Breast Care Nurses also needs to be looked into. Breast cancer management has been brought to the next level, i.e. individualised approach, especially amongst women with early-stage disease. The Ministry of Health Malaysia is committed to ensure that we will provide a quality treatment service for our population suffering from breast cancer. Tempat Pembuangan Sampah Haram di Tanah Lot Kosong Menyumbang dalam Pembiakan Denggi!